The Administrative review meeting at Rabindra Bhawan auditorium in Krishnanagar. 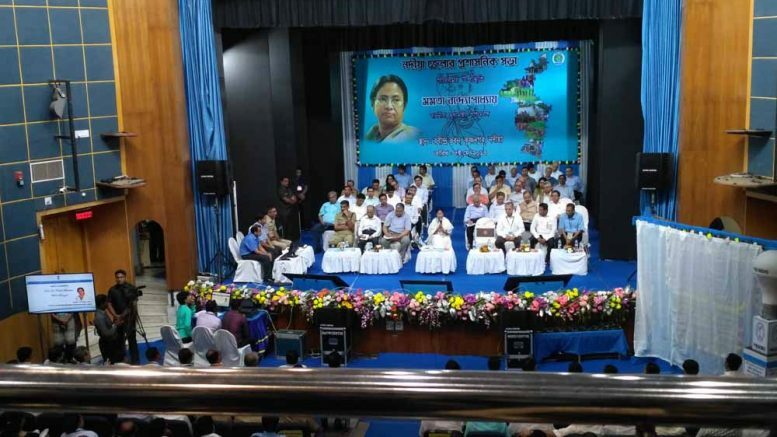 Krisnanagar, May 5: Chief Minister Mamata Banerjee today accused three promoting agencies for misleading villagers in Bhangar to stop the work of Power grid station using money and muscle power. Without naming the agencies, which have purchased huge quantity of land from the farmers, the Chief Minister accused the agencies of making a nexus with Maoists, BJP, CPM and Congress to misled people against setting up of power grid sub-station in Bhangar that eventually turned to be violent. The Chief Minister today called upon the people across the state, who suffers from low voltage to identify those who have been misleading them about “radiation” from power towers and to be united to resist their campaign for sake of development. Otherwise the state government would give up such projects without any second thought. Speaking at an administrative review meeting in Krisnanagar, Mamata Banerjee said: “I have taken clear decision that if the people don’t come up and resist such propaganda, such sub stations will not be set up”. “Aapnara Charley hobey, Na holey hobey Na”, she said for the people. In Bhangar Chief Minister Mamata Banerjee faced a major challenge, when local people, mostly land losers, backed by Maoist, set up tough opposition and clashed with the police. Two persons were died in the clash allegedly in police firing. Eventually, the state government had announced relocation of the sub-station. Chief Minister raised the issue while discussing “low voltage” problem in Nadia. She praised Nadia administration for achieving success fulfilling the complete target of rural electrification, but at the same time lashed the power department officials for the low voltage problem. “Na holey just give Na, Ami siddhanta niyechi”, she said. Pandey said: “There are certain areas where such problem persists, which have been identified and necessary action plan had been prepared”. Chief Minister advised Pandey to take up projects where no problem persists at all and to prepare district wise plan. For Nadia, the state government has decided to set up 15 new sub stations, 15 sub stations capacity will be increased as well as 15 new transformers will be set up for which power department would incur Rupees 450 Stores. © 2018 News from Nadia. All rights reserved.